The dictionary defines patina as "a surface appearance of something grown beautiful especially with age or use." In the car world this growth takes many forms. A little reddish rust peaking out from a wheel well that's seen many a winter, paint faded and peeling from cooking in the summer sun on long family outings, rock chips and small dents gathered like so many medals awarded for reliable service, and the unmistakable wear along the top of a truck bed where many a tool and toy has been loaded, strapped down, and unloaded again for years on end. Today's example has a little bit of all these flavors. To a lot of folks, Mark's C10 may not look like it belongs in a car show like Importfest, but I'll be damned if it didn't catch my attention before any other build under the roof that day. To be fair, there was a bit of cheating going on as I heard the idling diesel out in front of the convention center while walking up from the streetcar stop (then watched the smokiest 3-point turn I've ever witnessed) but I can't say I didn't enjoy watching the black smoke blow over the waves of tourists snapping photos with their cell phones. The evidence of repeated coal rolls is hard to hide. The drum and train horn setup were a nice touch, but what isn't pictured is just as neat. 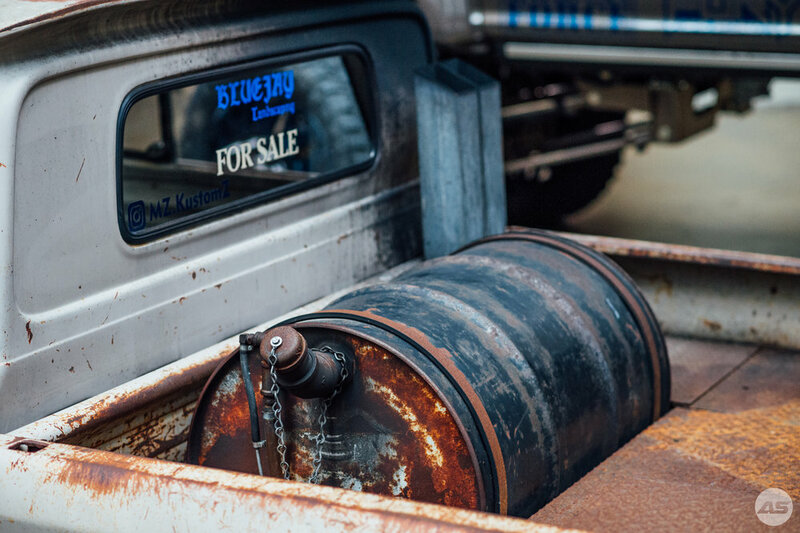 The Accuair setup is tucked under the false truckbed near the tailgate, allowing for most of the bed to hold whatever without worrying about the fittings getting knocked loose from sliding cargo. Even with the huge 22" wheels, various angles around the truck just make them disappear. The chopped engine bay and stepside fenders - acting as dually overfenders - in the rear certainly help. Speaking of the bay, a 12V Cummins sits front and center, providing only the best in diesel noises. I may not know too much about much from the pre-90's USDM, but I definitely have a lot of love for this build. Considering a couple years back the truck was down to a cab and the frame around the engine bay, the whole package has aged and settled together so well together and has such a presence that even I (an avid JDM fanboy) drooled all over the floor. Even parked next to Mark's other ride - a 2017 Ford F450 - the C10 held it's own all event. Luckily I snapped a bunch of photos before the doors opened!